The most wonderful time of the year cannot be squeezed into just one month when you're talking about fall. September, October, November all play a role during the changing colors, cooling weather and special days to commemorate the upcoming holidays. Gillespie Florists has the best bouquets and centerpieces for anniversaries, birthdays, congratulations, Thanksgiving, special events, and many more for this exciting time of year! Starting off with SNACKS! Because what is better than a cornucopia of sweets and treats you can enjoy anytime and then refill with fruits, more snacks, and/or gourds and small pumpkins! It's a perfect way to greet the fall season with comfort food and colors! 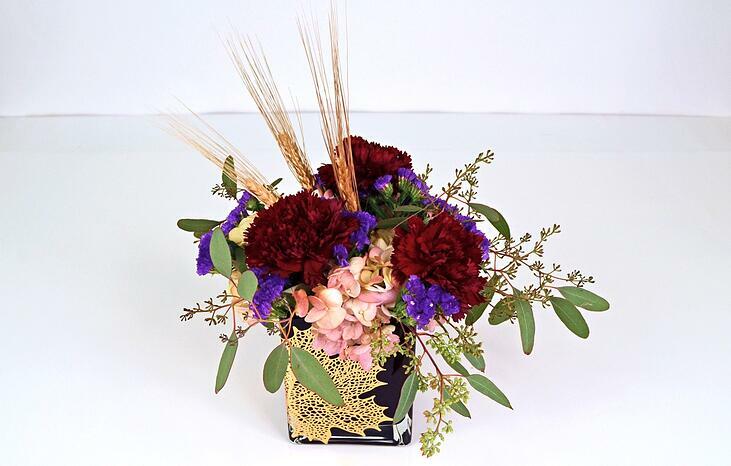 A darling bouquet of fall colored daisies, red carnations, yellow solidago, dried wheat stalks in a ginger jar. It is a sweet way to say "I Love You" "Thinking of You" "Happy Birthday" or "Just Because" with these bright color blooms. Our talented floral designers created the stunning Sultana for our 2015 fall collection and we have been in love with it ever since. Creamy pink hydrangea paired with deep burgandy carnations and accesorized with dried wheat stalks, purple statice, and fancy cubed vase. 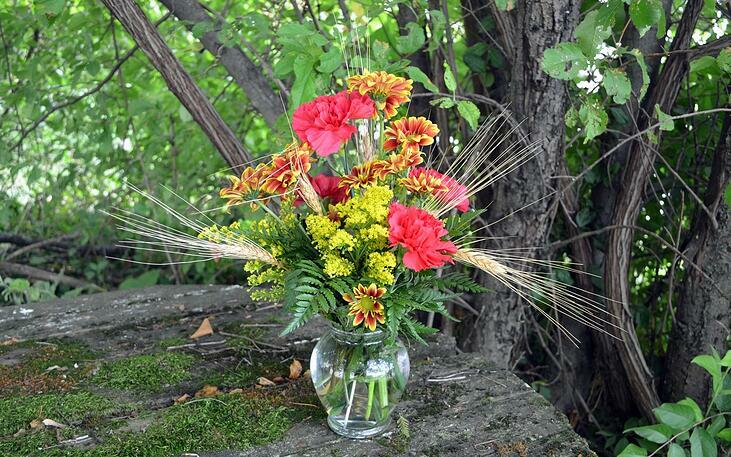 This bouquet is a romantic expression of a quiet and crisp afternoon heated with the warmth of sunshine. 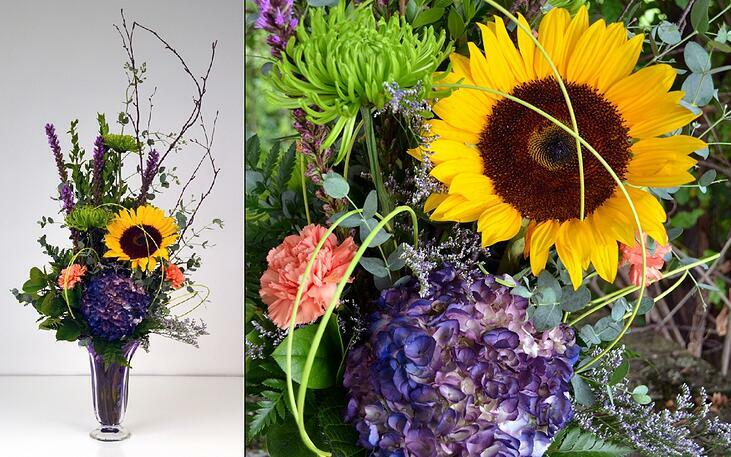 Nothing like going big or going home with this striking vased arrangement! Moonlit Nights is artfully designed for a special occasion such as an anniversary, company event or simply to say "I love you" in a very grand way! Large golden sunflowers, bright green fuji mums, birch branches, liatris, peach carnations, green midollino sticks, gunni eucalyptus, limonium and hydrangea in a gorgeous vase! Fall season is a magical time of year. Why not throw bit of glitter in to celebrate the excitement. 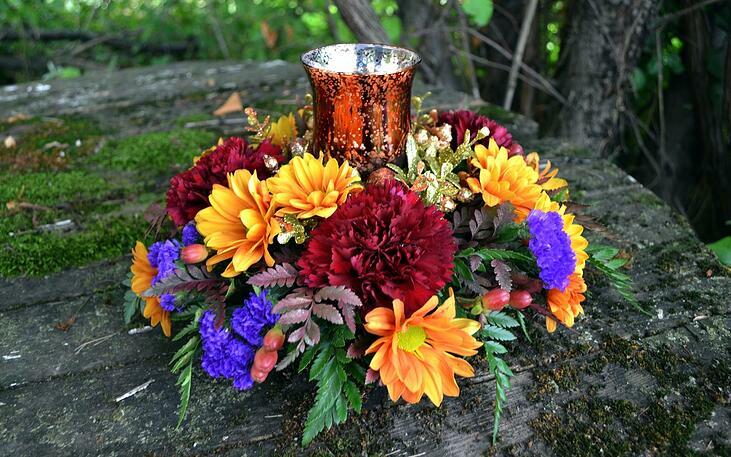 Sparkling Cider does the job nicely with a shimmering keepsake hurricane, a tea light, burgundy carnations, fall color daisies, purple statice, hypericum berries and tinted baker’s fern! 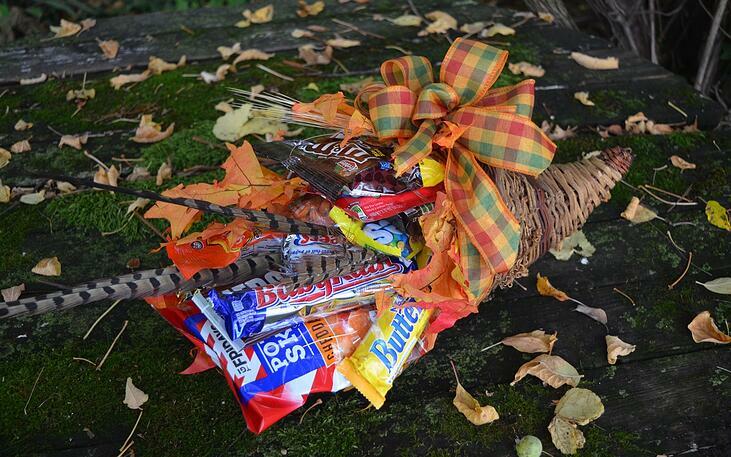 A small centerpiece to add holiday flair to a cozy family dinner, office party, Thanksgiving or just because! Speaking of table pieces, we have plenty in our Thanksgiving collection to consider. There could be an article dedicated to our top ten Thanksgiving centerpieces, however today we will focus on one grand arrangement. 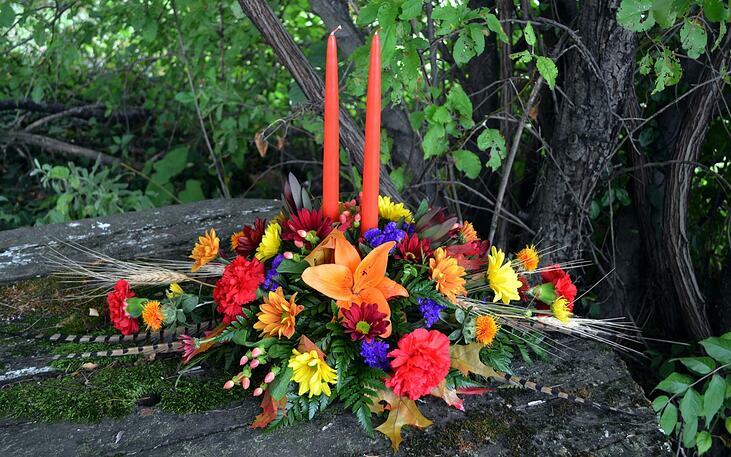 Glorious in color, Spicy Nutmeg has much to offer with two taper candles, orange asiatic lilies, fall daisies, purple statice, hypericum berry, wheat, pheasant feathers, glycerin fall oak leaves, leucadendron, red carnations and safflower. This centerpiece will be a feast for the eyes while delicious food of your Thanksgiving celebration is being set around the table. Are we salivating yet? I am. Thinking of eating all the delicious food and then afterward sitting on the sofa listening to the crackling sounds of a fire. 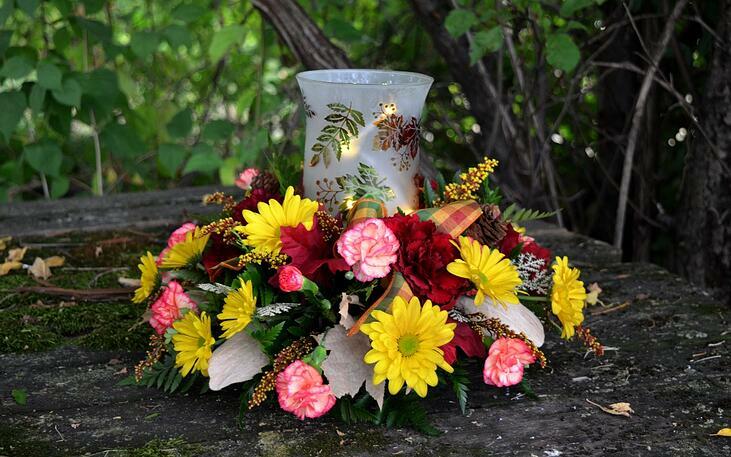 Our Heart Warmer bouquet also has the soothing, cozy feeling of a fireside with the colors of warm golden daisies, burgundy carnations, novelty mini-carnations, yellow solidago, glycerin fall oak leaves, small pine cones, fall silk accents, fall plaid ribbon, and a keepsake hurricane etched with leaves. Don't worry about tealights for this hurricane because there are battery-operated LED lights to keep the glow going. All this talk of food, cozy chilly nights gives me all sorts of warm fuzzies and excited for the upcoming holidays! Special occasion, birthday, anniversary, Thanksgiving dinner, family gathering, company event, etc; Gillespie Florists carries a variety of bouquets to fit any occasion during the fall season. Check out our website to find the perfect bouquet for your next event. Want to find something seasonally appropropriate for any budget and occasion? Visit our Monthly Specials page for the best choices updated monthly!